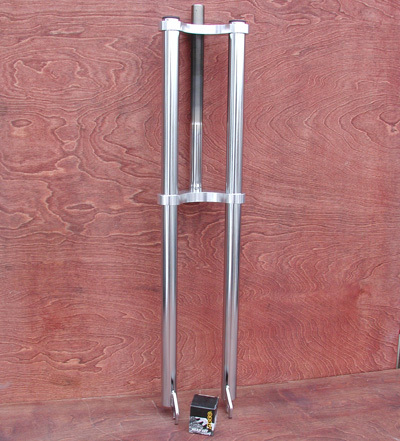 Triple Tree Chopper Fork with a 1" Threaded steer tube & Headset. This is our Custom Bicycle version, Fitting Most Antique Fat Tire Townie Lowrider Cruiser Bikes. This fork is Full length, un Cut and Comes with a Headset. This fork is great for the custom user and gives you a wide Range of Options, Fitting most any Vintage and Classic Cruiser Bikes. You Will Notice the steer tube is real long and will need to be cut down. Fork will take some simple Customization to Fit your Bike. 1. You will Have to Cut the steer tube to fit your Bike. 2 Use The Head set included for a proper fit. 3. Adjust the Fork Legs with a 6mm allen wrench, to the Desired Length, Use the fork legs at Full length for a Chopper raked look, Shorten and Cut The Legs for a Stouter Look. The Fork will Fit any Bike that takes a 1 " Steer tube. The Headset that is included will fit Traditional Cruisers like Schwinn, CWC: Western Flyer, Hawthorne, and Roadmaster Bikes. This is our Custom Triple Tree Fork version. We also Have a Different item that us a precut Bolt on Schwinn Version of this fork.